Canyons! A new sound world for Arik Levy's upcoming exhibition. Review by Kay Roberts of "Preliminaires" at the Slott Gallery, Paris. Here is a recent review by Kay Roberts of "Preliminaires". Exhibition at the Slott Gallery, Paris until Feb. 12. Leon Milo, Sound design in Collaboration with Arik Levy. Exhibition « Preliminaries » : design at the threshold of love. As an extension of a project on the theme of love, SLOTT gallery have invited four designers to play out their fantasies, giving shape and meaning, breathing life into their conceptions of preliminaries. They have approached this subject from different and complementary viewpoints that together offer a panorama of creation like no other seen before. Arik Levy's major part of this exhibition, for which I contributed sound and interactive programing, unveils his work on the spoken and the unspoken of intimate relations with his series of installations entitled « Confessions » that includes, among other elements, an examination of the iconography of sexuality alongside a kind of modern home confessional. and emotions using a sense which is too often ignored. Arik asked me to make what he now calls a "Voice Positivisor". What we see of this is a white computer screen and a microphone. On approching the screen, we see a faint line of text. When one speaks in to the mic we hear phrases spoken back to us by one of six voices which I recorded especially for this experience. Arik gave me 29 written phrases which were recorded independetly by 3 women and 3 men. One never knows which voice or which phrase will come back to us, but it is always a good surprise which leaves us feeling very positive and smiling! When the voice speaks, the corresponding text is shown on the white screen. Other abience consisted of a multi track recording which I made during a dinner party hosted by the gallery owner the night before the opening in the exhibition space. I also recorded the sound of the gallery's shower, in the bathroom of the exhibition space. These sounds, contribute to the feeling of a most convivial and loving living environment! It was an interesting acoustic addition and nice surprise to have diffused these sounds in the same resonant space to which they were recorded. It created a sonic unity and non-obtrusive quality which is at times difficult to achive when using ambient sound to accompany art and create a sonic environment. To top off the sensory experience, Arik baked a cake in the gallery's kitchen for the opening, adding a warm and fabulous chocolate perfume to the evening! As Arik said, we would all be better off, instead of saying to one another "Why don't you hug me? ", we would just say, "Hug me!". Here are a some images from the sound design programming for the exhibition. Best to all for a wonderful, loving New Year! Here is Screenshot of the voice program, open for editing. A video installation of "Hug", by Arik Levy. 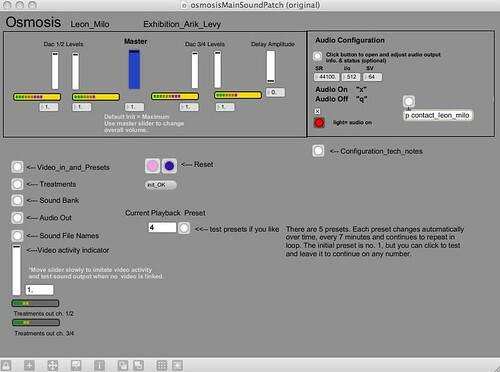 A screenshot of the sound program as it is seen in the installation. Osmosis_ Video/Sound Installation for Arik Levy. I have just completed a video/sound installation for designer, Arik Levy's solo exhibition for Swarovski at the Salone Internazionale del Mobile, in Milan. The team included myself on sound, Thomas Boaziz on video and Stéphane Maguet, owner of Numeriscausa, who oversaw the production of the project with the team at ldesign for Arik Levy..
Swarovski commissioned Arik Levy to create an exhibition of work inspired by, and created with the unique concept of crystal. Levy has created a series of installations that will illustrate the diversity of Swarovski crystal. You can read more about it here, on this well documented design blog. My part in this 800 square-meter exhibit was to create an interactive sound world which would accompany a 5x7 meter, 3D image of a diamond. This shape is constantly deformed, exploded and reconfigured according to various parameters and driven by people moving in front of the screen, around the defined space. I should be receiving images from the show very soon. Below, I have posted some screenshots of the MaxMsp program which I made for the installation. The program is made up of 8 stereo sound banks which are constantly playing back at different speeds, including different panning and various treatments, depending on the number of people and the activity of the spectators, as well as, the color of the diamond. The sounds come mostly from samples of glass, crystal, ice, rocks, moving earth and bowed percussion instruments which I recorded in my studio. They are modified by 2 time-based harmonizers which change the pitch, sound quality (freq. modulation), delay and feedback. The amazing space which Arik has conceived to expose his original works of art and design is 100 meters long by 8 meters wide. It flows, as the title of the expo suggests, and culminates with this huge video/sound world. A joyous and very physical experience! One shakes arms and legs, dances and jumps in front of the giant, floating, organic and other-worldly vessel which seems to crave our attention!! Hope that you can make it. Osmosis patch control, originally uploaded by time/texture.